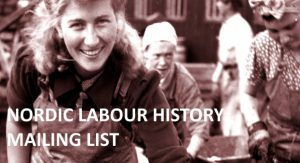 Swedish Labour Movement’s Archives and Library, Södertörn University and Stockholm University started in the spring of 2013 a new joint seminar series on global labour history. From autumn 2014 Swedish Labour Movement’s Archives and Library remains as the sole organizer. The first kick-off meeting began with a short lectures on the need for discussions and research on global labour history in Sweden with the presentation of current projects. In the spring of 2013 the serie began with seminars with a number of presentations by for instance Anna Gavanas (Linköping University), Verity Burgmann (Melbourne University), Goran Ryden (Uppsala University) Dorothy Sue Coble (Rutgers University), Suzanne Franzway (University of South Australia), Mary Margaret Fonow (Arizona State University) and Yevette Richards (George Mason University). For more information on upcoming seminars will be published as soon as the dates are set. Venue spot for seminars are if nothing else is indicated, at Swedish Labour Movement’s Archives and Library. Will be updated as soon as new seminars have been planned. Participants: Silke Neunsinger (ARAB) & Ylva Waldemarson (Södertörn University), Dorothy Sue Cobble (Rutgers University), Yevette Richards Jordan (George Mason University), Maria Bosdotter (former Handelsanställdas förbund), Jonny Hjelm (Umeå University), Mary Margaret Fonow (Arizona State University) and Suzanne Franzway (University of South Australia). Participants: Anna Gavanas with others. Kick off meeting for the new seminar serie – arranged in collaboration with ARAB and Södertörn University.